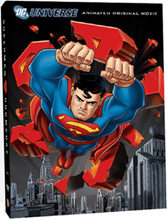 The direct-to-DVD Superman Doomsday animated feature, due out on September 18th (see 'Superman Doomsday DVD Out September 18th'), sports a dynamic lenticular cover that provides three iconic images to illustrate the saga of the Man of Steel's demise and resurrection. The PG-13 rated DVD, which has an MSRP of $19.99, is the first in a series of direct-to-DVD releases featuring DC Comics characters announced by Warner Bros. (see 'DC's Direct-to-Video Animated DVDs'), and in terms of packaging it will be a hard act to follow. The Doomsday DVD's cover presents different images from different points of view starting with a Superman symbol that drips blood. The symbol rotates and drips more blood before Supeman crashes through in a dynamic display of his superhuman abilities.